Italy celebrates Christmas and the winter holidays with special events and festivals. Italy's winter holiday season generally starts with the Feast Day of the Immaculate Conception on December 8, a national holiday, and runs through Epiphany, the 12th day of Christmas, on January 6. Then Carnevale, Italian carnival, is celebrated throughout Italy in late winter. Italian National holidays in winter are December 8, 25, and 26 and January 1 and 6. Note: Make sure to book your trip to Italy for the holidays way in advance as airfare and hotel rates tend to be expensive (or sold out, if you wait too long). In addition to nativity scenes, Christmas lights and trees are becoming popular, too. In the Vatican City, a huge Christmas tree is put up in Saint Peter's Square along with a life-size nativity scene. Christmas Eve and Christmas Day are often spent with family, and big meals are prepared. There's usually a midnight mass on Christmas Eve. The day after Christmas, Saint Stephen's Day is also a national holiday. Prior to Christmas, Italian Christmas markets (Mercatino di Natale) start popping up in many Italian cities and towns. These range from small local markets to huge daily Christmas markets in Naples that start around December 13, Santa Lucia Day. Some of the best Christmas markets are in the northern regions where there's a German heritage. In Rome, Piazza Navona holds a huge fair with Babbo Natale, Father Christmas (or Santa Claus as Americans call him). Traditionally, the main focus of Christmas decorations in Italy is the presepe, a Nativity scene or Christmas crib. The Christmas crib is said to have originated with Saint Francis (see Saint Francis sites in Italy) and the craft of carving nativity figures started in the 13th century. Today Naples is famous for making nativity figures and is the top place to see nativity scenes. Most churches and houses put up some kind of nativity display. Some towns put up elaborate displays in the main piazza, as well. Nativity pageants often take place on December 24 to 26 and again for Epiphany, the 12th day of Christmas, celebrated on January 6. People in costumes act out the parts for the nativity, some with as many as 500 participants. Pageants held on Epiphany often include a procession to the Cathedral. Rome is one of Italy's top destinations for Christmas season travel. Rome has a large Christmas market, nativity displays, and several huge Christmas trees. Of course, you can easily visit Saint Peter's Square and the Vatican from Rome, too. The Vatican, the heart of the Catholic religion, is always decorated and festive for Christmas. 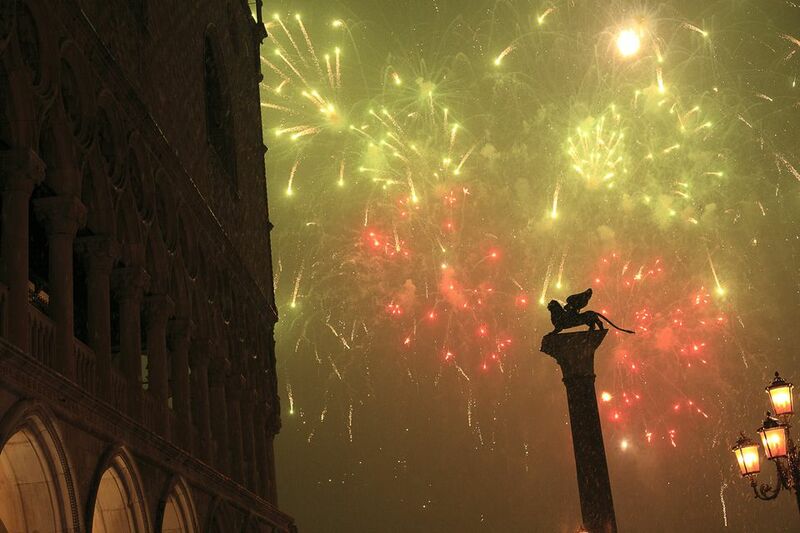 New Year's Eve is La Festa di San Silvestro, celebrated December 31. Fireworks, music, and dancing are part of the celebrations and, as usual, food is one of the stars of New Year's Eve. Parties often last until sunrise to welcome the first morning of the new year. Don't forget to wear your red underwear for luck! Epiphany, January 6, is the day children traditionally receive their gifts—not from Santa Claus but from La Befana, an old woman (some call her a witch) who flies around on a broomstick the night of January 5 delivering gifts. Children hang up their stockings on January 5 before they go to bed and hope to find them filled with goodies the next morning. On the religious side, living nativities and processions often take place for Epiphany. In Vatican City, hundreds of pilgrims dressed in ancient costume parade to the Vatican for a special morning mass. January 6 is a national holiday. Carnevale, also known as Carnival or Mardi Gras, is celebrated in Italy and many places around the world 40 days before Easter, a final party before Ash Wednesday and the restrictions of Lent. Although Venice is famous for its Carnevale celebrations, Carnevale is celebrated throughout Italy and events often include costume parties, elaborate masks, and parades. Festivities may start two to four weeks before the actual Carnevale date (see Carnevale dates by year).